Objectives To review the evidence for an association of white matter hyperintensities with risk of stroke, cognitive decline, dementia, and death. Data sources PubMed from 1966 to 23 November 2009. Study selection Prospective longitudinal studies that used magnetic resonance imaging and assessed the impact of white matter hyperintensities on risk of incident stroke, cognitive decline, dementia, and death, and, for the meta-analysis, studies that provided risk estimates for a categorical measure of white matter hyperintensities, assessing the impact of these lesions on risk of stroke, dementia, and death. Data extraction Population studied, duration of follow-up, method used to measure white matter hyperintensities, definition of the outcome, and measure of the association of white matter hyperintensities with the outcome. Data synthesis 46 longitudinal studies evaluated the association of white matter hyperintensities with risk of stroke (n=12), cognitive decline (n=19), dementia (n=17), and death (n=10). 22 studies could be included in a meta-analysis (nine of stroke, nine of dementia, eight of death). White matter hyperintensities were associated with an increased risk of stroke (hazard ratio 3.3, 95% confidence interval 2.6 to 4.4), dementia (1.9, 1.3 to 2.8), and death (2.0, 1.6 to 2.7). An association of white matter hyperintensities with a faster decline in global cognitive performance, executive function, and processing speed was also suggested. Conclusion White matter hyperintensities predict an increased risk of stroke, dementia, and death. Therefore white matter hyperintensities indicate an increased risk of cerebrovascular events when identified as part of diagnostic investigations, and support their use as an intermediate marker in a research setting. Their discovery should prompt detailed screening for risk factors of stroke and dementia. Several studies have assessed the relation between white matter hyperintensities and risk of stroke, dementia, and death, with partly conflicting results. We systematically reviewed and meta-analysed all published longitudinal studies that tested the association of white matter hyperintensities with risk of stroke, dementia, and death, both in the general population and in a hospital based setting. Using predefined search terms we identified references through searches of PubMed from 1966 to 23 November 2009 (see web extra methods 1). We also identified papers by reviewing the reference lists of relevant articles. Studies were limited to those in adults. We included only prospective studies with longitudinal data on the association of white matter hyperintensities with risk of stroke, dementia, cognitive decline, and death. We excluded studies if they evaluated white matter lesions only by computed tomography (because of the lower sensitivity of this method for measuring white matter lesions compared with magnetic resonance imaging10); carried out magnetic resonance imaging at the end of follow-up instead of at baseline; or had a sample size of fewer than 50 patients. For studies with more than one publication describing results among overlapping groups of participants and with the same outcome measure, we included only the dataset with the longest follow-up. If the follow-up period was identical we included only the dataset with the largest number of patients (see web extra methods 2). From the studies we extracted data on number of participants, general population versus high risk participants, mean age, duration of follow-up, characteristics of magnetic resonance imaging and definition of white matter hyperintensities, outcome definition (all strokes versus intracerebral haemorrhage or ischaemic stroke; all types of dementia versus Alzheimer’s disease, vascular dementia, mixed vascular and Alzheimer’s dementia; and neuropsychological measurements used to assess cognitive decline), and number of events that occurred during follow-up. For the measure of the association between white matter hyperintensities and the outcome we recorded, when available, hazard ratios, odds ratios, and adjustment variables when applicable. Both authors extracted the information from each study, resolving any disagreements by discussion. We defined studies as being in high risk populations if they were carried out in people selected for the presence of prevalent disease such as mild cognitive impairment, stroke, or other vascular events, or for the presence of a high risk factor profile. (See web extra tables 1-5 for the inclusion criteria for each study.) Stroke was defined as an acute onset focal neurological deficit of presumed vascular cause lasting at least 24 hours or interrupted by death within 24 hours. Web extra tables 1-5 show the number of events by stroke type (ischaemic versus haemorrhagic), when available. Unless specified differently (see web extra tables 1-5) we defined dementia according to the criteria of the Diagnostic and Statistical Manual of Mental Disorders, third or fourth editions11 12; Alzheimer’s disease based on the criteria of the National Institute of Neurological and Communicative Disorders and Stroke and the Alzheimer’s Disease and Related Disorders Association for definite, probable, or possible Alzheimer’s disease13; and vascular dementia according to the National Institute of Neurological Disorders and Stroke and the Association Internationale pour la Recherche et l’Enseignement en Neurosciences criteria.14 Cognitive decline was defined as worsening performance on repeated neuropsychological tests. In the absence of consensus on which neuropsychological test was the most appropriate, we did not apply restrictions on type of test used. We examined separately tests of global cognitive function and tests assessing performances in specific cognitive domains (see web extra tables 1-5 for types of test used in each study). Web extra table 6 details study quality criteria, including loss to follow-up, surveillance carried out for the diagnosis of incident events, description of the definition used for these events, and event subtypes. We also report the availability of effect estimates and whether the analysis took into account time to event. Cochrane RevMan version 4·2 software (www.cc-ims.net/RevMan/current.htm) was used to carry out meta-analysis of the outcomes dementia, stroke, and death. Graphs were designed using the rmeta package in R (http://cran.r-project.org/web/packages/rmeta/index.html). We calculated pooled hazard ratios using the random effects inverse variance method. In a few studies only odds ratios were available despite the longitudinal design,15 16 17 therefore we considered the odds ratios as approximations of hazard ratios.18 Significant heterogeneity was defined by a P value <0.05 or I2 >50%. We carried out meta-analysis when at least three studies were available for the same outcome; we included only studies that used a categorical measure of white matter hyperintensities. When more than two categories were present we used the hazard ratio for the highest category compared with the lowest category. Studies for which the association of white matter hyperintensities with the outcome was studied solely in a continuous fashion (per unit increase or standard deviation increase in quantitative volume of white matter hyperintensities or semiquantitative grade for white matter hyperintensities) were not included in the meta-analysis. Indeed, white matter hyperintensities were measured on completely different scales in the various cohorts, using either automated quantitative volume measures or different types of visual semiquantitative non-linear volume measures. Although a sample size weighted meta-analysis could be done, this would not provide a pooled effect estimate. When both adjusted and unadjusted values were available for the hazard ratio, we included the value adjusted for vascular risk factors. For studies that measured deep white matter hyperintensities and periventricular hyperintensities separately and did not provide a global risk estimate for white matter hyperintensities, we meta-analysed the results for periventricular hyperintensities (see web extra methods 3). In a secondary analysis we reran the meta-analysis replacing the results for periventricular hyperintensities with those for deep white matter hyperintensities. All meta-analyses were done separately for population based studies and studies in a high risk population, and overall. Six population based studies15 19 20 21 29 30 and six studies in high risk populations16 22 23 24 25 26 examined the relation between white matter hyperintensities and incident stroke (see web extra table 1). All six population based studies could be included in the meta-analysis (fig 2⇓), which showed a significant association of white matter hyperintensities with risk of stroke (hazard ratio 3.1, 95% confidence interval 2.3 to 4.1, P<0.001). 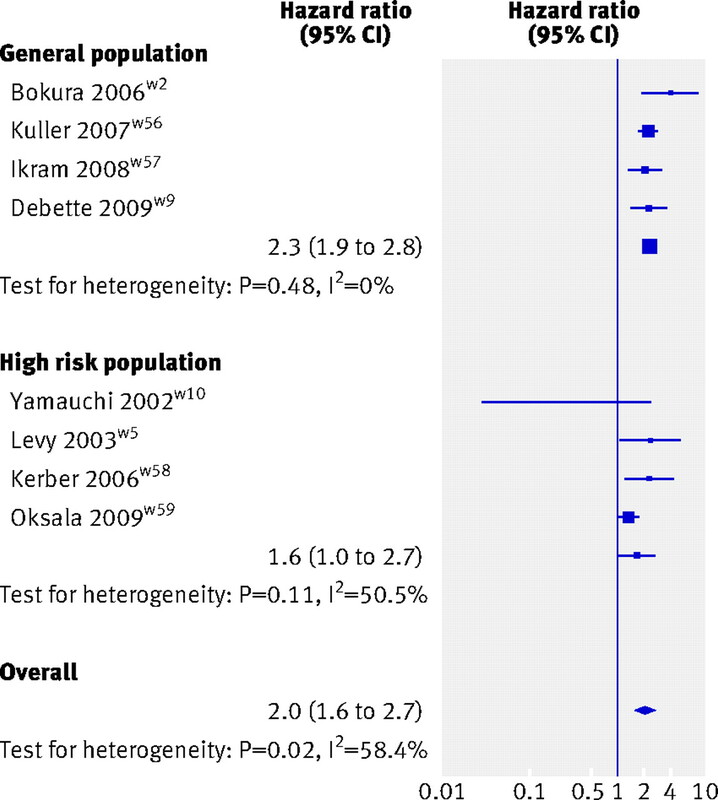 Three studies done in high risk populations could be included in the meta-analysis (fig 2), showing a significant association of white matter hyperintensities with the risk of stroke (7.4, 2.4 to 22.9, P=0.001).16 24 26 Three studies in high risk populations could not be included in the meta-analysis, two because white matter hyperintensities were studied continuously only,23 25 and a third because only intracerebral haemorrhage was studied as an outcome (see web extra table 1).22 All three found a significant association of white matter hyperintensities with incident stroke. The meta-analysis combining the data from population based and high risk populations yielded a significant association of white matter hyperintensities with incident stroke (3.5, 2.5 to 4.9, P<0.001; see web extra fig 2). When combining data from population based studies and high risk populations the risk of dementia associated with white matter hyperintensities was increased overall (1.9, 1.3 to 2.8, P=0.002; fig 3, also see web extra fig 3). Three population based studies31 32 33 and three studies in high risk populations41 42 49 investigated the relation between white matter hyperintensities and incident Alzheimer’s disease (see web extra table 2). Only one population based study31 and two studies in high risk populations41 49 fulfilled our predefined criteria for meta-analysis. Meta-analysis of these yielded a significant association of white matter hyperintensities with the risk of Alzheimer’s disease (see web extra fig 4). Two population based studies31 33 and one study in a high risk population41 tested the relation between white matter hyperintensities and incident vascular dementia (see web extra table 2). We did not carry out a meta-analysis as only two studies fulfilled our predefined criteria for meta-analysis,31 41 but all three studies found a significant association of white matter hyperintensities with incident vascular dementia (see web extra table 2). Four population based studies15 29 64 65 and six studies in high risk populations16 23 25 66 67 68 prospectively investigated the relation between white matter hyperintensities and mortality (see web extra table 5). All four population based studies could be included in the meta-analysis (fig 4⇓), which showed a significant association of white matter hyperintensities with risk of death (2.3, 1.9 to 2.8, P<0.001). Four studies done in high risk populations could also be meta-analysed (fig 4); this showed an association of white matter hyperintensities with mortality (1.6, 1.01 to 2.7, P=0.04). Two studies could not be included because white matter hyperintensities were studied continuously only,23 25 both found a significant association of white matter hyperintensities with mortality (see web extra table 5). When studies from both population based samples and high risk populations were pooled, white matter hyperintensities were associated with an increased risk of death during follow-up (2.0, 1.6 to 2.7, P<0.001; fig 4, also see web extra fig 5). This systematic review of 46 studies, and meta-analysis, provides strong evidence that white matter hyperintensities are an important indicator of future risk of disease, being associated with an increased risk of stroke, cognitive decline (especially in the executive function and processing speed domains), dementia, and death. White matter hyperintensities were significantly associated with an increased risk of stroke, both in the general population and in high risk populations with a history of stroke or vascular disease. It could be hypothesised that this association merely reflects the relation of vascular risk factors with stroke. Indeed, age and hypertension are the main predictors of white matter hyperintensities,69 70 and other vascular risk factors such as smoking, diabetes, and history of vascular disease were also shown to be associated with lesions in white matter.71 In all studies, however, the association of white matter hyperintensities with stroke remained significant after adjustment for vascular risk factors. Although some residual confounding may exist, this suggests that white matter hyperintensities reflect either the overall effect of uncontrolled vascular risk factors better than the mere presence or absence of each individual factor or that other, yet unknown, factors play a role in the association of white matter hyperintensities with stroke. White matter hyperintensities were associated with an increased risk of dementia in the general population, but not in studies on high risk populations (mainly with mild cognitive impairment or a history of stroke). When subtypes of dementia were assessed, the three studies that investigated the relation of white matter hyperintensities with incident vascular dementia found a significant association, both in the general population and in patients with mild cognitive impairment.31 33 41 Conversely, although the meta-analysis testing the relation of white matter hyperintensities with incident Alzheimer’s disease yielded an overall significant association, this association was driven by the large population based study,31 whereas the two smaller studies on patients with mild cognitive impairment did not identify any association.41 49 Finally, our systematic review suggests that, in most studies looking at the association of white matter hyperintensities with decline in cognitive performance, white matter hyperintensities were associated with a faster decline in global cognitive performance as well as in executive function and processing speed. This was true both in the general population and in high risk patients with mild cognitive impairment, memory problem, or cerebrovascular disease. Although we corrected for statistical heterogeneity in the meta-analyses, the measurement and analysis of white matter hyperintensities varied substantially (see web extra tables 1-5). One important source of heterogeneity was the automated quantitative versus visual semiquantitative measurement of white matter hyperintensity volume, although visual semiquantitative scales were shown to correlate well with volumetric measures.80 Furthermore, total intracranial volume was unequally included in the analyses to account for differences in head size, and not all studies explicitly distinguished white matter hyperintensities from lacunar infarcts. Consensus recommendations on the measurement of white matter hyperintensities and their progression, as have been published for instance for carotid intima-media thickness,81 would be useful to improve the comparability of future studies. Another limitation is that some studies could not be included in the meta-analysis because white matter hyperintensity was studied only as a continuous variable using different scales. All the results, including those that were not incorporated in the meta-analysis, are available in web extra tables 1-5. The pooled hazard ratios for dichotomous measures of burden of white matter hyperintensities also need to be interpreted with caution, given the heterogeneous definitions of these measures across studies. They should therefore not be extrapolated to estimate the individual risk of stroke, dementia, or death in a patient with white matter hyperintensities on magnetic resonance imaging. To be as comprehensive as possible in this review we included studies using different tests or criteria for the diagnosis of cognitive decline and dementia, which is an additional source of heterogeneity. Finally, given the strong association of vascular risk factors both with burden of white matter hyperintensities and with the clinical outcomes we studied, it would be interesting to assess the modifying effect of these risk factors on the associations we reported. This was not feasible in the present paper, however, as the nature and definition of vascular risk factors included in the analyses varied substantially across studies. In conclusion, our systematic review and meta-analysis provides strong evidence that white matter hyperintensities predict the risk of stroke, dementia, and mortality. This emphasises that white matter hyperintensities indicate increased cerebrovascular risk when identified clinically as part of diagnostic investigations and supports their use as an intermediate marker in a research setting. Further studies assessing the impact of progression of white matter hyperintensities on stroke and dementia are needed to help design therapeutic trials incorporating progression of white matter hyperintensities as an intermediate end point. We thank for their collaboration F Pasquier, S Bombois, and D Leys (Department of Neurology, Lille University Hospital, France); PA Wolf, S Seshadri, A Beiser, and R Au (Department of Neurology, Boston University School of Medicine), and C DeCarli (University of California at Davis). Contributors: SD did the literature search, wrote the first draft, and prepared the tables and some figures. HSM did the literature search, revised the draft manuscript, and prepared some of the figures. SD and HSM are guarantors. Funding: SD was supported by a grant from the European Neurological Society, a Fulbright grant, and an award from the Bettencourt-Schueller and the Lilly foundations. Competing interests: All authors have completed the unified competing interest form at http://www.icmje.org/coi_disclosure.pdf (available on request from the corresponding author) and declare that: (1) SD was supported by a grant from the European Neurological Society, a Fulbright grant, and an award from the Bettencourt-Schueller and the Lilly foundations; (2) SD and HSM have no relationship with companies that might have an interest in the submitted work in the previous 3 years; (3) that their spouses, partners, or children have no financial relationships that may be relevant to the submitted work; and (4) that they have no non-financial interests that may be relevant to the submitted work. Data sharing: Additional data not available. Ylikoski A, Erkinjuntti T, Raininko R, Sarna S, Sulkava R, Tilvis R. White matter hyperintensities on MRI in the neurologically nondiseased elderly. Analysis of cohorts of consecutive subjects aged 55 to 85 years living at home. Stroke1995;26:1171-7. Garde E, Mortensen EL, Krabbe K, Rostrup E, Larsson HB. Relation between age-related decline in intelligence and cerebral white-matter hyperintensities in healthy octogenarians: a longitudinal study. Lancet2000;356:628-34. Pantoni L, Garcia JH. Pathogenesis of leukoaraiosis: a review. Stroke1997;28:652-9. Fazekas F, Kleinert R, Offenbacher H, Schmidt R, Kleinert G, Payer F, et al. Pathologic correlates of incidental MRI white matter signal hyperintensities. Neurology1993;43:1683-9. Van Swieten JC, van den Hout JH, van Ketel BA, Hijdra A, Wokke JH, van Gijn J. Periventricular lesions in the white matter on magnetic resonance imaging in the elderly. A morphometric correlation with arteriolosclerosis and dilated perivascular spaces. Brain1991;114:761-74. O’Sullivan M, Lythgoe DJ, Pereira AC, Summers PE, Jarosz JM, Williams SC, et al. Patterns of cerebral blood flow reduction in patients with ischemic leukoaraiosis. Neurology2002;59:321-6. Topakian R, Barrick TR, Howe FA, Markus HS. Blood-brain barrier permeability is increased in normal-appearing white matter in patients with lacunar stroke and leucoaraiosis. J Neurol Neurosurg Psychiatry2010;81:192-7. Launer LJ. Epidemiology of white matter lesions. Top Magn Reson Imaging2004;15:365-7. Schmidt R, Scheltens P, Erkinjuntti T, Pantoni L, Markus HS, Wallin A, et al. White matter lesion progression: a surrogate endpoint for trials in cerebral small-vessel disease. Neurology2004;63:139-44. Lechner H, Schmidt R, Bertha G, Justich E, Offenbacher H, Schneider G. Nuclear magnetic resonance image white matter lesions and risk factors for stroke in normal individuals. Stroke1988;19:263-5. American Psychiatric Association. Diagnostic and statistical manual of mental disorders. 3rd ed. APA, 1987. American Psychiatric Association. Diagnostic and statistical manual of mental disorders. 4th ed. APA, 1994. McKhann G, Drachman D, Folstein M, Katzman R, Price D, Stadlan EM. Clinical diagnosis of Alzheimer’s disease: report of the NINCDS-ADRDA Work Group under the auspices of Department of Health and Human Services Task Force on Alzheimer’s Disease. Neurology1984;34:939-44. Roman GC, Tatemichi TK, Erkinjuntti T, Cummings JL, Masdeu JC, Garcia JH, et al. Vascular dementia: diagnostic criteria for research studies. Report of the NINDS-AIREN International Workshop. Neurology1993;43:250-60. Bokura H, Kobayashi S, Yamaguchi S, Iijima K, Nagai A, Toyoda G, et al. Silent brain infarction and subcortical white matter lesions increase the risk of stroke and mortality: a prospective cohort study. J Stroke Cerebrovasc Dis2006;15:57-63. Yamauchi H, Fukuda H, Oyanagi C. Significance of white matter high intensity lesions as a predictor of stroke from arteriolosclerosis. J Neurol Neurosurg Psychiatry2002;72:576-82. Firbank MJ, Burton EJ, Barber R, Stephens S, Kenny RA, Ballard C, et al. Medial temporal atrophy rather than white matter hyperintensities predict cognitive decline in stroke survivors. Neurobiol Aging2007;28:1664-9. Symons MJ, Moore DT. Hazard rate ratio and prospective epidemiological studies. J Clin Epidemiol2002;55:893-9. Wong TY, Klein R, Sharrett AR, Couper DJ, Klein BE, Liao DP, et al. Cerebral white matter lesions, retinopathy, and incident clinical stroke. JAMA2002;288:67-74. Vermeer SE, Hollander M, van Dijk EJ, Hofman A, Koudstaal PJ, Breteler MM. Silent brain infarcts and white matter lesions increase stroke risk in the general population: the Rotterdam Scan Study. Stroke2003;34:1126-9. Kuller LH, Longstreth WT Jr, Arnold AM, Bernick C, Bryan RN, Beauchamp NJ Jr. White matter hyperintensity on cranial magnetic resonance imaging: a predictor of stroke. Stroke2004;35:1821-5. Smith EE, Gurol ME, Eng JA, Engel CR, Nguyen TN, Rosand J, et al. White matter lesions, cognition, and recurrent hemorrhage in lobar intracerebral hemorrhage. Neurology2004;63:1606-12. Appelros P, Samuelsson M, Lindell D. Lacunar infarcts: functional and cognitive outcomes at five years in relation to MRI findings. Cerebrovasc Dis2005;20:34-40. Gerdes VE, Kwa VI, ten Cate H, Brandjes DP, Buller HR, Stam J. Cerebral white matter lesions predict both ischemic strokes and myocardial infarctions in patients with established atherosclerotic disease. Atherosclerosis2006;186:166-72. Fu JH, Lu CZ, Hong Z, Dong Q, Luo Y, Wong KS. Extent of white matter lesions is related to acute subcortical infarcts and predicts further stroke risk in patients with first ever ischaemic stroke. J Neurol Neurosurg Psychiatry2005;76:793-6. Naka H, Nomura E, Takahashi T, Wakabayashi S, Mimori Y, Kajikawa H, et al. Combinations of the presence or absence of cerebral microbleeds and advanced white matter hyperintensity as predictors of subsequent stroke types. AJNR Am J Neuroradiol2006;27:830-5. Kobayashi S, Okada K, Koide H, Bokura H, Yamaguchi S. Subcortical silent brain infarction as a risk factor for clinical stroke. Stroke1997;28:1932-9. Longstreth WT Jr, Diehr P, Manolio TA, Beauchamp NJ, Jungreis CA, Lefkowitz D. Cluster analysis and patterns of findings on cranial magnetic resonance imaging of the elderly: the Cardiovascular Health Study. Arch Neurol2001;58:635-40. Debette S, Beiser A, DeCarli C, Au R, Himali JJ, Kelly-Hayes M, et al. Association of MRI markers of vascular brain injury with incident stroke, mild cognitive impairment, dementia and mortality: the Framingham Offspring Study. Stroke 2010;41:600-6. Buyck JF, Dufouil C, Mazoyer B, Maillard P, Ducimetiere P, Alperovitch A, et al. Cerebral white matter lesions are associated with the risk of stroke but not with other vascular events: the 3-City Dijon Study. Stroke2009;40:2327-31. Kuller LH, Lopez OL, Newman A, Beauchamp NJ, Burke G, Dulberg C, et al. 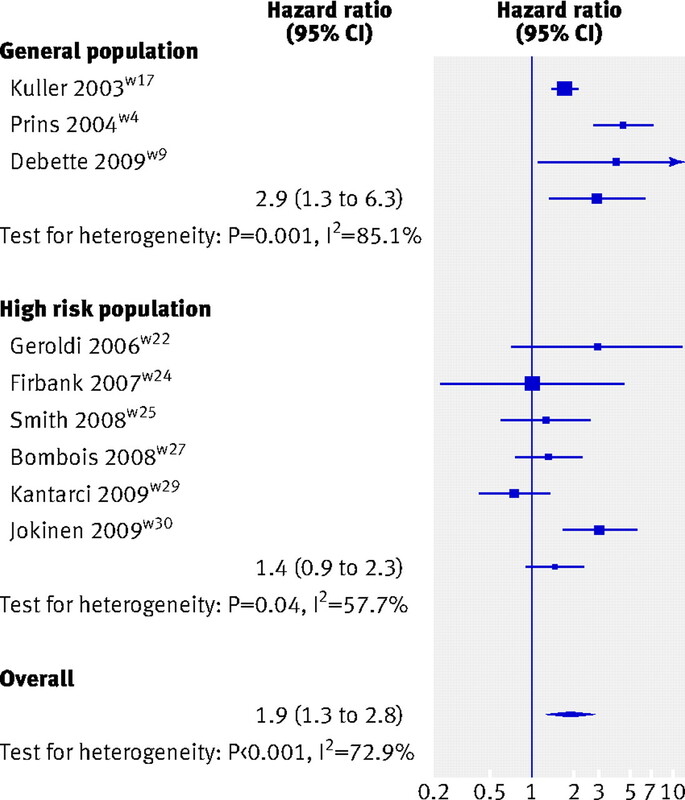 Risk factors for dementia in the cardiovascular health cognition study. Neuroepidemiology2003;22:13-22. Prins ND, van Dijk EJ, den Heijer T, Vermeer SE, Koudstaal PJ, Oudkerk M, et al. Cerebral white matter lesions and the risk of dementia. Arch Neurol2004;61:1531-4. Meguro K, Ishii H, Kasuya M, Akanuma K, Meguro M, Kasai M, et al. 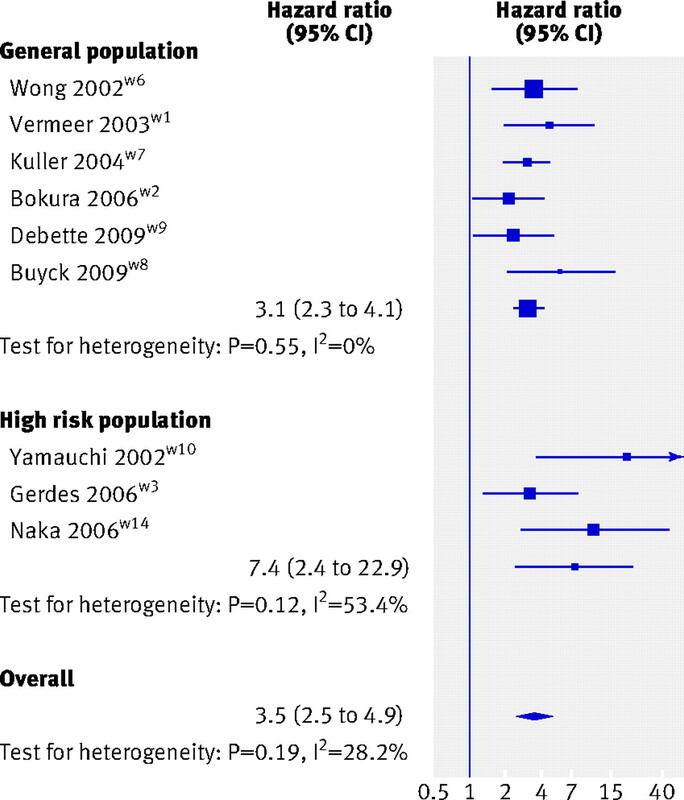 Incidence of dementia and associated risk factors in Japan: the Osaki-Tajiri Project. J Neurol Sci2007;260:175-82. Steffens DC, MacFall JR, Payne ME, Welsh-Bohmer KA, Krishnan KR. Grey-matter lesions and dementia. Lancet2000;356:1686-7. Korf ES, Wahlund LO, Visser PJ, Scheltens P. Medial temporal lobe atrophy on MRI predicts dementia in patients with mild cognitive impairment. Neurology2004;63:94-100. DeCarli C, Mungas D, Harvey D, Reed B, Weiner M, Chui H, et al. Memory impairment, but not cerebrovascular disease, predicts progression of MCI to dementia. Neurology2004;63:220-7. Geroldi C, Rossi R, Calvagna C, Testa C, Bresciani L, Binetti G, et al. Medial temporal atrophy but not memory deficit predicts progression to dementia in patients with mild cognitive impairment. J Neurol Neurosurg Psychiatry2006;77:1219-22. Steffens DC, Potter GG, McQuoid DR, MacFall JR, Payne ME, Burke JR, et al. Longitudinal magnetic resonance imaging vascular changes, apolipoprotein E genotype, and development of dementia in the neurocognitive outcomes of depression in the elderly study. Am J Geriatr Psychiatry2007;15:839-49. Smith EE, Egorova S, Blacker D, Killiany RJ, Muzikansky A, Dickerson BC, et al. Magnetic resonance imaging white matter hyperintensities and brain volume in the prediction of mild cognitive impairment and dementia. Arch Neurol2008;65:94-100. Tapiola T, Pennanen C, Tapiola M, Tervo S, Kivipelto M, Hanninen T, et al. MRI of hippocampus and entorhinal cortex in mild cognitive impairment: a follow-up study. Neurobiol Aging2008;29:31-8. Bombois S, Debette S, Bruandet A, Delbeuck X, Delmaire C, Leys D, et al. Vascular subcortical hyperintensities predict conversion to vascular and mixed dementia in MCI patients. Stroke2008;39:2046-51. Van Straaten EC, Harvey D, Scheltens P, Barkhof F, Petersen RC, Thal LJ, et al. Periventricular white matter hyperintensities increase the likelihood of progression from amnestic mild cognitive impairment to dementia. J Neurol2008;255:1302-8. Rosano C, Aizenstein HJ, Wu M, Newman AB, Becker JT, Lopez OL, et al. Focal atrophy and cerebrovascular disease increase dementia risk among cognitively normal older adults. J Neuroimaging2007;17:148-55. Kuller LH, Lopez OL, Jagust WJ, Becker JT, DeKosky ST, Lyketsos C, et al. Determinants of vascular dementia in the Cardiovascular Health Cognition Study. Neurology2005;64:1548-52. Dufouil C, Godin O, Chalmers J, Coskun O, MacMahon S, Tzourio-Mazoyer N, et al. Severe cerebral white matter hyperintensities predict severe cognitive decline in patients with cerebrovascular disease history. Stroke2009;40:2219-21. Kantarci K, Weigand SD, Przybelski SA, Shiung MM, Whitwell JL, Negash S, et al. Risk of dementia in MCI: combined effect of cerebrovascular disease, volumetric MRI, and 1H MRS. Neurology2009;72:1519-25. Jokinen H, Kalska H, Ylikoski R, Madureira S, Verdelho A, van der Flier WM, et al. Longitudinal cognitive decline in subcortical ischemic vascular disease—the LADIS Study. Cerebrovasc Dis2009;27:384-91. Staekenborg SS, Koedam EL, Henneman WJ, Stokman P, Barkhof F, Scheltens P, et al. Progression of mild cognitive impairment to dementia: contribution of cerebrovascular disease compared with medial temporal lobe atrophy. Stroke2009;40:1269-74. Kuller LH, Shemanski L, Manolio T, Haan M, Fried L, Bryan N, et al. Relationship between ApoE, MRI findings, and cognitive function in the Cardiovascular Health Study. Stroke1998;29:388-98. De Groot JC, De Leeuw FE, Oudkerk M, Van Gijn J, Hofman A, Jolles J, et al. Periventricular cerebral white matter lesions predict rate of cognitive decline. Ann Neurol2002;52:335-41. Schmidt R, Ropele S, Enzinger C, Petrovic K, Smith S, Schmidt H, et al. White matter lesion progression, brain atrophy, and cognitive decline: the Austrian stroke prevention study. Ann Neurol2005;58:610-6. Prins ND, van Dijk EJ, den Heijer T, Vermeer SE, Jolles J, Koudstaal PJ, et al. Cerebral small-vessel disease and decline in information processing speed, executive function and memory. Brain2005;128:2034-41. Mungas D, Reed BR, Jagust WJ, DeCarli C, Mack WJ, Kramer JH, et al. 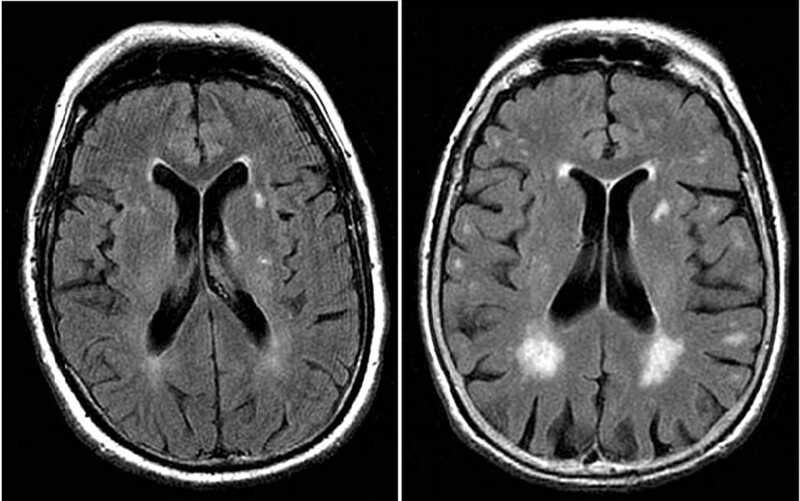 Volumetric MRI predicts rate of cognitive decline related to AD and cerebrovascular disease. Neurology2002;59:867-73. Van der Flier WM, van der Vlies AE, Weverling-Rijnsburger AW, de Boer NL, Admiraal-Behloul F, Bollen EL, et al. MRI measures and progression of cognitive decline in nondemented elderly attending a memory clinic. Int J Geriatr Psychiatry2005;20:1060-6. Mungas D, Harvey D, Reed BR, Jagust WJ, DeCarli C, Beckett L, et al. Longitudinal volumetric MRI change and rate of cognitive decline. Neurology2005;65:565-71. Van den Heuvel DM, ten Dam VH, de Craen AJ, Admiraal-Behloul F, Olofsen H, Bollen EL, et al. Increase in periventricular white matter hyperintensities parallels decline in mental processing speed in a non-demented elderly population. J Neurol Neurosurg Psychiatry2006;77:149-53. Debette S, Bombois S, Bruandet A, Delbeuck X, Lepoittevin S, Delmaire C, et al. Subcortical hyperintensities are associated with cognitive decline in patients with mild cognitive impairment. Stroke2007;38:2924-30. Schmidt R, Fazekas F, Kapeller P, Schmidt H, Hartung HP. MRI white matter hyperintensities: three-year follow-up of the Austrian Stroke Prevention Study. Neurology1999;53:132-9. Longstreth WT Jr, Arnold AM, Beauchamp NJ Jr, Manolio TA, Lefkowitz D, Jungreis C, et al. Incidence, manifestations, and predictors of worsening white matter on serial cranial magnetic resonance imaging in the elderly: the Cardiovascular Health Study. Stroke2005;36:56-61. Kramer JH, Mungas D, Reed BR, Wetzel ME, Burnett MM, Miller BL, et al. Longitudinal MRI and cognitive change in healthy elderly. Neuropsychology2007;21:412-8. Van Dijk EJ, Prins ND, Vrooman HA, Hofman A, Koudstaal PJ, Breteler MM. Progression of cerebral small vessel disease in relation to risk factors and cognitive consequences: Rotterdam Scan study. Stroke2008;39:2712-9. Silbert LC, Howieson DB, Dodge H, Kaye JA. Cognitive impairment risk: white matter hyperintensity progression matters. Neurology2009;73:120-5. Kuller LH, Arnold AM, Longstreth WT Jr, Manolio TA, O’Leary DH, Burke GL, et al. White matter grade and ventricular volume on brain MRI as markers of longevity in the cardiovascular health study. Neurobiol Aging2007;28:1307-15. Ikram MA, Vernooij MW, Vrooman HA, Hofman A, Breteler MM. Brain tissue volumes and small vessel disease in relation to the risk of mortality. Neurobiol Aging 2009;30:450-6. Kerber KA, Whitman GT, Brown DL, Baloh RW. Increased risk of death in community-dwelling older people with white matter hyperintensities on MRI. J Neurol Sci2006;250:33-8. Oksala NK, Oksala A, Pohjasvaara T, Vataja R, Kaste M, Karhunen PJ, et al. Age related white matter changes predict stroke death in long term follow-up. J Neurol Neurosurg Psychiatry2009;80:762-6. Levy RM, Steffens DC, McQuoid DR, Provenzale JM, MacFall JR, Krishnan KR. MRI lesion severity and mortality in geriatric depression. Am J Geriatr Psychiatry2003;11:678-82. Longstreth WT Jr, Manolio TA, Arnold A, Burke GL, Bryan N, Jungreis CA, et al. Clinical correlates of white matter findings on cranial magnetic resonance imaging of 3301 elderly people. The Cardiovascular Health Study. Stroke1996;27:1274-82. Dufouil C, de Kersaint-Gilly A, Besancon V, Levy C, Auffray E, Brunnereau L, et al. Longitudinal study of blood pressure and white matter hyperintensities: the EVA MRI Cohort. Neurology2001;56:921-6. Jeerakathil T, Wolf PA, Beiser A, Massaro J, Seshadri S, D’Agostino RB, et al. Stroke risk profile predicts white matter hyperintensity volume: the Framingham Study. Stroke2004;35:1857-61. Nordahl CW, Ranganath C, Yonelinas AP, Decarli C, Fletcher E, Jagust WJ. White matter changes compromise prefrontal cortex function in healthy elderly individuals. J Cogn Neurosci2006;18:418-29. Zlokovic BV. Neurovascular mechanisms of Alzheimer’s neurodegeneration. Trends Neurosci2005;28:202-8. Alonso A, Mosley TH Jr, Gottesman RF, Catellier D, Sharrett AR, Coresh J. Risk of dementia hospitalisation associated with cardiovascular risk factors in midlife and older age: the Atherosclerosis Risk in Communities (ARIC) study. J Neurol Neurosurg Psychiatry2009;80:1194-201. Kovari E, Gold G, Herrmann FR, Canuto A, Hof PR, Michel JP, et al. Cortical microinfarcts and demyelination significantly affect cognition in brain aging. Stroke2004;35:410-4. Greenberg SM, Gurol ME, Rosand J, Smith EE. Amyloid angiopathy-related vascular cognitive impairment. Stroke2004;35:2616-9. Yoshita M, Fletcher E, Harvey D, Ortega M, Martinez O, Mungas DM, et al. Extent and distribution of white matter hyperintensities in normal aging, MCI, and AD. Neurology2006;67:2192-8. Chui HC, Zarow C, Mack WJ, Ellis WG, Zheng L, Jagust WJ, et al. Cognitive impact of subcortical vascular and Alzheimer’s disease pathology. Ann Neurol2006;60:677-87. Bots ML, van Swieten JC, Breteler MM, de Jong PT, van Gijn J, Hofman A, et al. Cerebral white matter lesions and atherosclerosis in the Rotterdam Study. Lancet1993;341:1232-7. Kapeller P, Barber R, Vermeulen RJ, Ader H, Scheltens P, Freidl W, et al. Visual rating of age-related white matter changes on magnetic resonance imaging: scale comparison, interrater agreement, and correlations with quantitative measurements. Stroke2003;34:441-5. Touboul PJ, Hennerici MG, Meairs S, Adams H, Amarenco P, Bornstein N, et al. Mannheim carotid intima-media thickness consensus (2004-2006). An update on behalf of the Advisory Board of the 3rd and 4th Watching the Risk Symposium, 13th and 15th European Stroke Conferences, Mannheim, Germany, 2004, and Brussels, Belgium, 2006. Cerebrovasc Dis2007;23:75-80. Dufouil C, Chalmers J, Coskun O, Besancon V, Bousser MG, Guillon P, et al. Effects of blood pressure lowering on cerebral white matter hyperintensities in patients with stroke: the PROGRESS (Perindopril Protection Against Recurrent Stroke Study) Magnetic Resonance Imaging Substudy. Circulation2005;112:1644-50. Atwood LD, Wolf PA, Heard-Costa NL, Massaro JM, Beiser A, D’Agostino RB, et al. Genetic variation in white matter hyperintensity volume in the Framingham Study. Stroke2004;35:1609-13. Carmelli D, DeCarli C, Swan GE, Jack LM, Reed T, Wolf PA, et al. Evidence for genetic variance in white matter hyperintensity volume in normal elderly male twins. Stroke1998;29:1177-81. Aharon-Peretz J, Daskovski E, Mashiach T, Tomer R. Natural history of dementia associated with lacunar infarctions. J Neurol Sci2002;203-4:53-5. Fazekas F, Ropele S, Schmidt R. Can small-vessel disease-related cerebral abnormalities be used as a surrogate marker for vascular dementia trials? J Neural Transm Suppl2002:61-7. Tzourio C, Anderson C, Chapman N, Woodward M, Neal B, MacMahon S, et al. Effects of blood pressure lowering with perindopril and indapamide therapy on dementia and cognitive decline in patients with cerebrovascular disease. Arch Intern Med2003;163:1069-75.